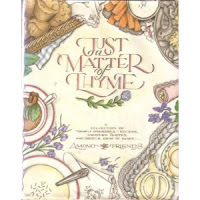 It's time for me to add information about a cookbook in my collection and a favorite recipe from it. Just a Matter of Thyme was given to me as a gift a very long time ago. Back in the 90s (not too long ago) I was carpooling with a friend to college about thirty miles away. We met a lady who we started providing a ride. I can't remember the exact circumstances, but she never drove. She gave each of us this cookbook as a token of her appreciation. Maybe she learned in our conversations, on our trips back and forth from school, that we both loved to cook. I wish I remembered her name, but I will always think of her when I make something from her very special gift... Just a Matter of Thyme. Saute chicken breasts in a pan sprayed with vegetable coating. Season to your taste with the salt, poultry seasoning and pepper. Brown lightly on both sides, cooking until tender, but not dry. Set aside until cool enough to dice. Mix with the remaining ingredients and refrigerate until serving. This may be served as a sandwich with lettuce and tomato, or on top of a bed of lettuce as a salad. Serves 4-6. ... To make things simple - I use can chicken. Our family likes this recipe best without eggs. I add sugar to taste, probably about 1/3 cup. Yellow grapes seem to taste the best! Many times, I add coarsely chopped walnuts. This salad is great with croissants ...mini ones are our choice. Kelley, Roxie. "Chicken Salad." Just a Matter of Thyme. St.Louis: Cracom Corporation, 1992. 53. Fresh green beans, washed and ends snapped. Bring to a boil. Cover and lower heat. Cook until tender, watching water level. Add water, if needed. If you do, add boiling water to the pan. Limit stirring your beans - I toss occasionally. In the meantime...wash small, new potatoes. I prefer the white ones over the red potatoes. Do not cut, leave whole. The smaller the size the better. I normally peel any bruises or spots with a potato peeler. I put potatoes in pan and add a little water...about the same as the green beans...enough to cover half the pan. Bring to a boil. Cover pan and lower heat. Cook until tender. After beans and potatoes are cooked, drain water from both pans and sit aside. In a large pan, fry bacon....no certain amount - just what you prefer. As bacon is browning, cut into smaller pieces. Add green beans. Toss to brown a little. Add salt, fresh ground pepper and garlic powder to taste. Add chopped onions. I use a vidalia onion. I then add a little beef or chicken broth to the pan. I prefer chicken broth and add just enough to take in all the juices and make a small amount of liquid at the bottom of the pan. I push the green beans to one side of the pan and add the new potatoes to the other half. I lower the heat to lowest setting, put the lid on and keep warm until ready to serve. Don't let the beans and new potatoes sit too long. Serve warm. We love to mash our potatoes with a fork and add butter and sour cream....like a baked potato. Try these Green Beans w/New Potatoes! I think your family will love them. Let me know what you think and if you come up with any new ideas to modify this recipe, please share. Grandma Mam was an amazing cook!. One of her best pies was "Raisin Pie." Mam lived over 100 healthy years. I have fond memories of visiting her home with her grandson (my husband). She cooked big meals and loved having us all in her home! I remember her pies and other sweets sitting in her kitchen ready for our sampling. I would consider her an old-timer who worked in her garden and kept her family close. We miss her! 2 cups raisins cooked in 2 cups water for a few minutes. Stir together 1 1/4 cups sugar and 2 tablespoons cornstarch. Whisk into cooked raisins. Add 3 tablespoons vinegar or lemon juice. Add 2 tablespoons butter. Pour into unbaked pie crust. Top with crust. Bake at 350 degree F. Watch closely. Pie crust: 2 cups flour, 1 cup Crisco, 1/2 cup water, 1/2 teaspoon salt. Mix with a pastry blender. I prefer the lemon juice instead of the vinegar. This is a very easy pie to make and ENJOY! For Father's Day I made my husband's favorite Key Lime Cake! Here is a picture. It's such a pretty cake. My daughter said today..."You could sell this cake!" That was a compliment I enjoyed. Hopefully, some day I will be selling desserts in my cafe I so much want to open! This will hopefully happen some summer...close to my retirement from teaching. I tried a new recipe from another one of Trisha Yearwood's cookbooks - Georgia Cooking in an Oklahoma Kitchen. We really enjoyed it! You could probably substitute already whipped cream for the heavy cream ...but I decided to whip the heavy cream. I added a few more cherries because I had purchased a 10-ounce jar. I didn't make this salad the night before as suggested. It was ready in a couple of hours. We'll see if it picks-up some sweetness after sitting in the refrigerator overnight. Try this salad and let me know what you think. Pour the boiling water into a large mixing bowl. Add the gelatin and stir until dissolved. Blend in the cream cheese, stirring until it is thoroughly mixed and the gelatin is completely dissolved. Cool in the refrigerator until the mixture thickens but is not fully gelled, about 45 minutes. Add the pineapple, bananas, cherries, and nuts and mix gently. In a separate bowl, use an electric mixer or whisk to beat the cream until stiff. Gently fold the whipped cream into the thickened gelatin mixture and pour into a 6 x 9 x 2-inch dish. Refrigerate overnight, or until firm. Source: Yearwood, Trisha. "Pink Salad." Georgia Cooking in an Oklahoma Kitchen. New York: Clarkson Potter Publishers, 2008. 55. Home Cooking with Trisha Yearwood: Stories & Recipes to Share with Family and Friends. A favorite find at the bookstore recently.... This cookbook is full of not only wonderful recipes but stories about family and friends. The family pictures and stories bring back memories of my childhood and encourages me to continue making memories for my family. One of the first recipes I made from this cookbook was the Key Lime Cake. It is awesome! It's on my husbands favorite list. I was never much of a key lime pie fan...but I am now a fan of Key Lime Cake. DIRECTIONS: Preheat oven to 350 degree F. Grease and flour three 9-inch round cake pans. In a large mixing bowl, mix the gelatin, sugar, flour, salt, baking powder and baking soda. Stir to mix well. Add the eggs, oil, orange juice, lemon juice and vanilla. Divide the batter evenly among the 3 pans and bake for 35 to 40 minutes. Test for doneness by lightly touching the tops of the layers or inserting a toothpick. Cool the layers in the pans for 5 minutes, then turn them out onto racks. While the layers are still hot, mix the lime juice and confectioners' sugar and pour it over the layers on the racks. You can pierce the layers with a fork to allow the glaze to soak in better. Allow the layers to cool completely as you prepare the icing. Cream the butter and cream cheese. Beat in the confectioners' sugar until the mixture is smooth and easy to spread. Spread the icing between the layers and on the top and sides of the cake. Source: Yearwood, Trisha. "Key Lime Cake." 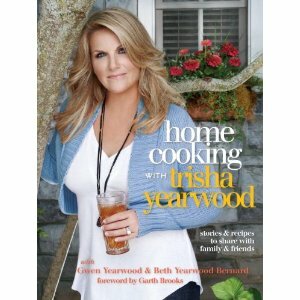 Home Cooking with Trisha Yearwood. New York: Clarkson Potter Publishers, 2010. 161-2. I MUST start my blog with information about my mom because that is where my love of cooking began! What more can I say? She was a wonderful MOM! She was a farmer's wife who devoted her time to working as a housewife and full-time mom. She cooked...she cleaned...and she loved! Mom taught me and my sister to cook and took us to 4-H meetings where we perfected what we learned from her at home. We encountered many talented ladies along the way who shared their kitchens and recipes with us. The first cookbooks I owned were those paperback 4-H versions of cookbooks. I still have some of them and look through my collection at times to find that recipe that I can't wait to make. The first recipe I am sharing with you is for Oatmeal Crispies. I learned to make these in my 4-H days. I don't know if the recipe came from one of those treasured 4-H cookbooks or from one of those talented 4-H leaders...but this recipe took me all the way to the Missouri State Fair where I won a blue ribbon. Here is a recipe for Oatmeal Crispies. I hope you enjoy them as much as my family does! Directions: Cream shortening and sugars. Add eggs and vanilla. Beat well. Sift dry ingredients. Add dry ingredients to creamed mixture. Add oats and nuts. Mix well. Shape into balls. Cook on ungreased baking sheet in a preheated oven (350 degree) for 10 minutes. Cool on cookie sheet before removing to a rack.